Have you ever wanted to attend a local Homeschool Convention? Now is your opportunity! 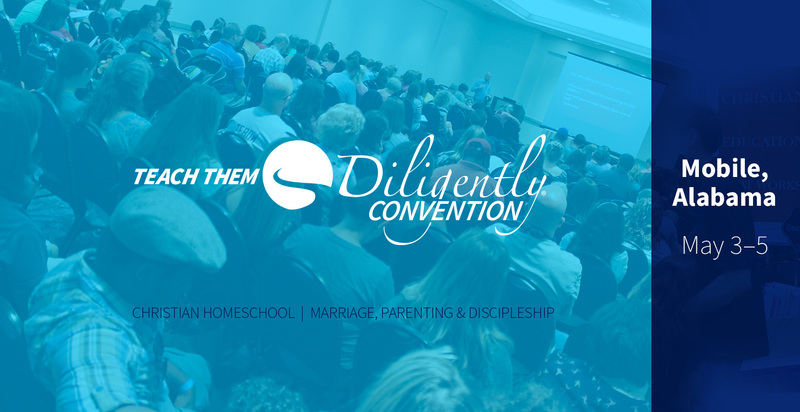 Teach Them Diligently is the largest Gospel-focused homeschool convention in the USA and it is coming to Mobile in just a few weeks. For more information about this wonderful opportunity or to register for the convention, click HERE. Convention dates are May 3-5 at the Mobile Convention Center. There will be a wide variety of sessions and speakers included in your registration fee. Download the app for additional information once you have registered to help organize your time to the fullest. Childcare is available ($50 for both days Friday – Saturday//ages 4-12), Teen Track sessions are included in the price of registration (ages 12+). Family registration covers your entire household (parents, kids, teens, babies, grandparents) – anyone who would like to attend, and they may attend ANY session individually. There are also additional workshops such as Robotics (age 8+) and SKRAFTY Live (Minecraft) – there is an additional fee of $50 per child for these sessions. A free Mom’s Night Out program, sponsored by Apologia is open to all Moms on Friday evening. A Men’s Breakfast and Special Guest Speaker is available for the men/youth on Saturday morning. Not sure WHY you should attend a homeschool convention? Many families have never experienced the benefits of this unique experience. Click HERE to read Leslie Nunnery’s story, Co-founder of the Teach Them Diligently Convention. Leslie shares how she felt attending her very first convention and the amazing benefits to her homeschool journey and her family.